The image is tightly framed and symmetrical. A tent, with numerous guy ropes to left and right, takes up most of the field of view. The canvas “doorway” is opened wide, but reveals nothing in the blackness within. And nothing can be seen beyond the tent – it’s all out of focus. The foreground is rocky, with a small attempt to make a homely entrance with a row of stones. The two little boys are prisoners, but nothing about them suggests they are captives. They are unsmiling but well-dressed (in a version of some uniform, with matching coats and hats) and seemingly well-fed. They are just left of centre, one with his arm around a tent pole. (This, I later learned, is “Inkermann”.) 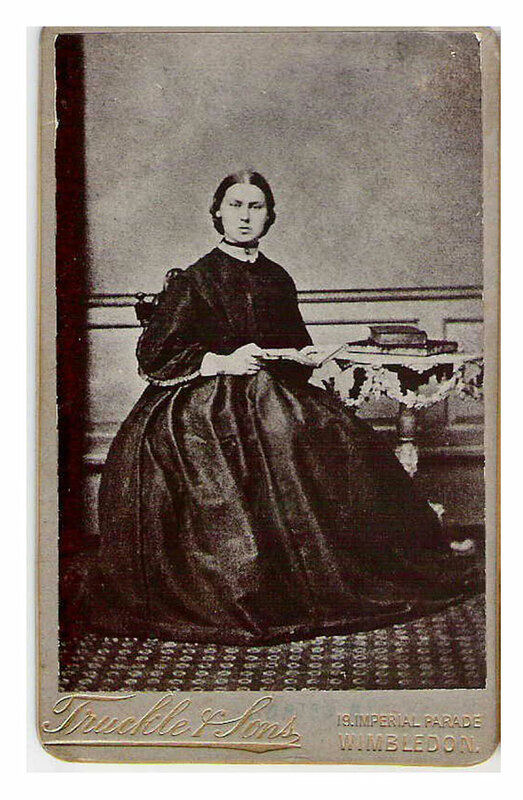 “Alma” is seated on a log, legs neatly together, his left foot nearly touching Colonel Brownrigg’s right foot. The boys look straight at the camera, but Brownrigg, just to the right of centre, looks away across their line off to our left. He seems perfectly relaxed, his legs wide apart, one hand on his thigh, the other on his sword, as if it were a walking stick. Tell Annie [their daughter] there are two Russian boys here who both would like to come to England which will she have Alma or Inkermann, such are their new names. One is an orphen [sic] the other has or had his parents in the town. They went out nutting last autumn & were taken, cried sadly but now would cry to go back. Jump forward 40 or so years and the photograph was reproduced (small) in V.R.I. – Her Life and Empire, edited by the Marquis of Lorne and published in 1901 shortly after Victoria’s death. Astonishingly, it was noticed by “Inkermann’s” son, who contacted the Daily Mail to tell them he recognised his father in the image. 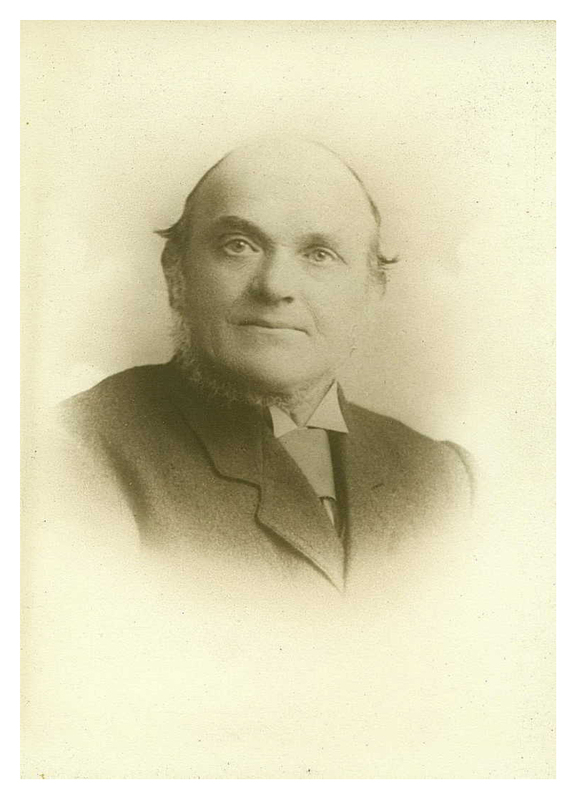 He was still alive, and working as “Simeon Sinca” in Wilton, near Salisbury – it was not his real name (which was originally Paskiewitch), but based on how he’d pronounced his adopted name “Inkermann”. 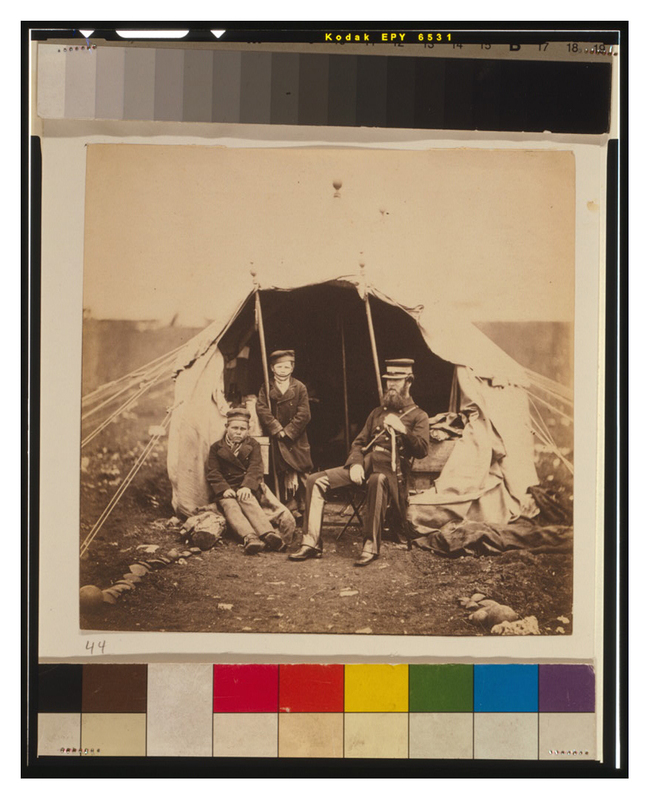 This interesting group was taken during the siege of Sebastopol, and represents Colonel Brownrigg, C.B., and two Russian boys who strayed out of the besieged city into the English lines. Here they were taken prisoners and were promptly adopted by the Brtish, under the names of “Alma” and “Inkermann.” They attached themselves so much to the Colonel as to follow him everywhere with the fidelity of spaniels. After the Mail interviewed “Simeon Sinca”, the story was picked up by other newspapers around the country. (Partly, perhaps, because of its strong defence of the British treatment of prisoners, then under fire for alleged atrocities during the Boer War.) Simeon recollected the photograph being taken. The picture is entitled “Tiny Prisoners of War,” and shows two little Russian boys who came into the English lines during the siege of Sebastopol, and were taken charge of by Colonel Brownrigg. It was one of the series of Crimean pictures published by Messrs Agnew, and was used in Part No.10 of “V.R.I” as an illustration to that portion of Queen Victoria’s life which was connected with the Crimean War. “I remember quite well that photo being taken; it was before Sebastopol, forty-six years ago. “After the battle of Alma, when the English, French and Turkish soldiers got into Balaclava, the Russian farmers became frightened, and ran inside the walls of Sebastopol, leaving the grape crops behind them. We boys got out and began picking the grapes, but one day we saw some English soldiers in front of us. We all ran away, and I and the other little one in the picture got under a big tub. Here we had to stay in fright all night and part of the next day. In the afternoon one of the soldiers came across our por old tub and knocked it over, and there was a surprise for him to see us two frightened little nippers. He has little expectation of ever tracing his Russian relatives, but marked copies of the “Daily Mail” will be sent to officers in the neighbourhood of the Crimea in the hope of finding them out, if possible. For the purposes of this blog, I must skip over Simeon Sinca’s arrival in Britain and his education at “the Working-Class Eton”, St Mark’s School, founded a decade before by the Revd Stephen Hawtrey, a local curate and tutor in mathematics at Eton. It is still not clear who paid for Simeon to study at St Mark’s, and where he was living while he did so – there were no boarding facilities for pupils until 1870. But there are suggestions that Brownrigg himself could have been involved, or Coleraine Vansittart, 11th Hussars (whose father is said to have given Hawtrey the land on which to build a new school), or even the Secretary of War, Sydney Herbert (see below). Perhaps inspired by his time in the ports of Sebastopol and Balaclava, or by the journey back from the Crimea to Britain, or even by trips made with Hawtrey to HMS Pembroke and the Suffolk seaside while he was at St Mark’s, in 1863 Simeon signed for 5 years as an apprentice seaman on a 3-masted barque. The ship was called – would you believe it? – the Florence Nightingale. Even the name “Pembroke” is going to turn to be spookily prescient. William Mitchell (c.1806-1900), “The Sailing Ship Florence Nightingale (1877). The Beacon Museum, Whitehaven. 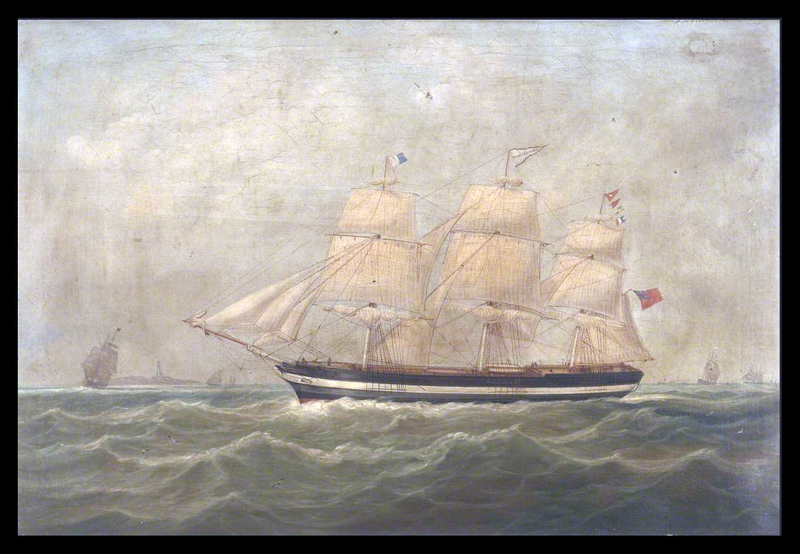 This painting is of the sailing ship ‘Florence Nightingale’ which was a barque of 1362 tons. She was launched by James Nevins, St John, New Brunswick in 1855. She was owned by Brocklebank of Liverpool until 1869. The artist lived at 149 King Street, Maryport in Cumbria. [Source: ArtUK: William Mitchell, Sailing Ship ‘Florence Nightingale’. The Beacon Museum, Whitehaven (accessed 20.11.2018). Initially, I was puzzled about how Simeon (and his wife Tirzah, below) could have been photographed by Truckle and Sons in South Wimbledon, south-west London, but a handwritten note in red on Simeon’s photograph (above) says “copied by”. 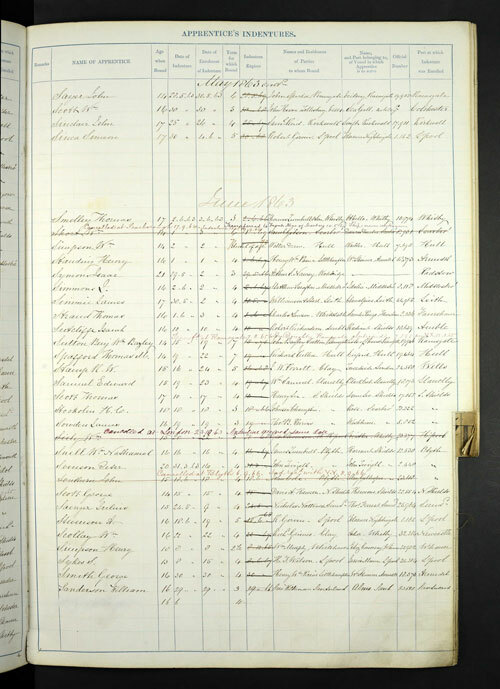 It is known from the 1911 Census that one of his daughters, Irene, once lived as a servant in Wimbledon, which suggests it was she who had the copies made. 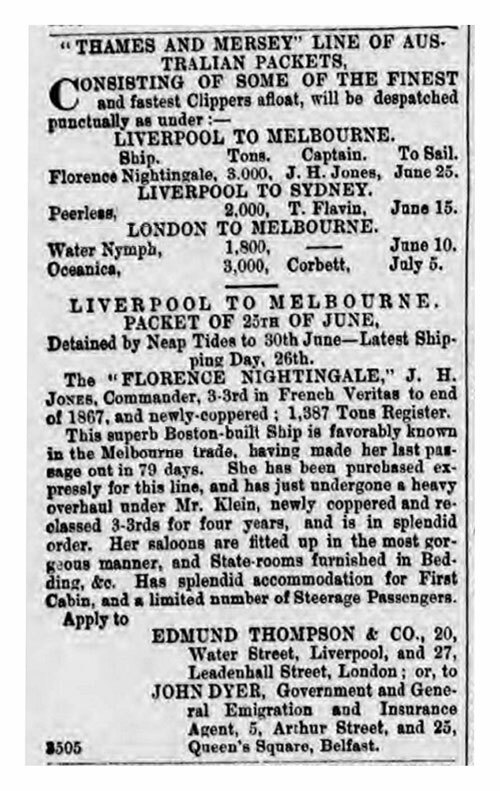 Advert in the Belfast News-Letter, Thursday 11 June 1863, p.2. By 1871 Simeon was a carpenter at Wilton House, Wilton, Wiltshire, married to Tirzah Jane Waldron, daughter of Joseph Waldron, a bailiff. 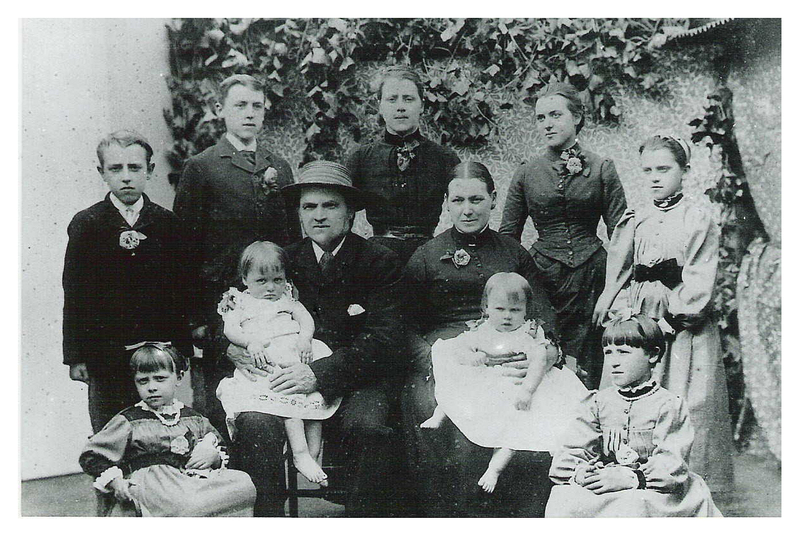 The couple had numerous children together, a fact which (judging by family photographs) was a source of great pride. The marriage of Simeon Sinca and Tirzah Jane Waldron, Wilton, 1871. Simeon Sinca, 25, Bachelor, Carpenter of Wilton, married Tirzah Jane Waldron, 24, Spinster, also of Wilton, daughter of Joseph Waldron, Bailiff. There is no reference to Simeon’s father. See also Simeon’s stylish and confident signature – his old head teacher, Stephen Hawtrey, had emphasized handwriting. Simeon may already have been a carpenter at Wilton House for some time before he married, as he exhibited his “beautiful model of a full-rigged ship” – I bet it was the Florence Nightingale – in Wilton earlier that year. 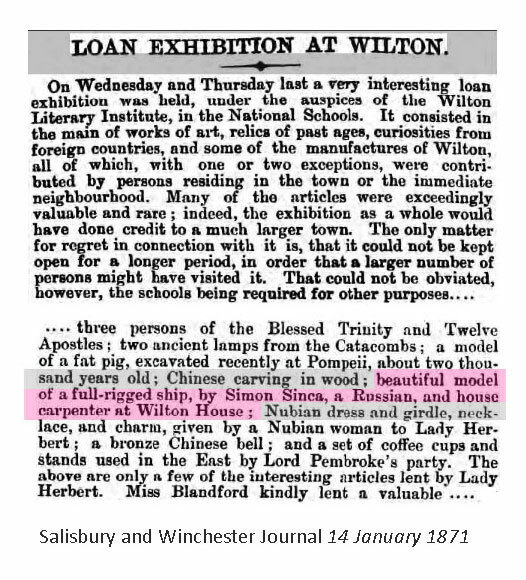 Exhibition of a “beautiful model of a full-rigged ship, by Simon [sic] Sinca, a Russian, and house carpenter at Wilton House”, Salisbury and Winchester Journal, 14 January 1871. How exactly Simeon had come to be in Wilton is as yet unknown, but there is perhaps a clue in this vivid memoir of Simeon’s life in Wilton by Edith Olivier (1872-1948), a novelist and the town’s first woman mayor. Sinca, ‘the Russian Sailor’, was a great person in the old Wilton days. Lord Pembroke found him somewhere on his travels, and brought him to Wilton as house-carpenter. He was obviously a Slav, with his short square figure, and his flat face marked with smallpox. He spoke very quickly, in a deep hollow voice, which sounded as if he had his head in a bucket. He never walked, but he ran everywhere, on the level, or up and down the ladders which seemed to be his native place. The Wilton Mummers had a phrase, ‘a foreign-off man’, and this describes Sinca, who was always ‘off’ somewhere with his foreignness. Making and letting off fireworks were among his far-fetched tricks, and when we had a display, he was in his element. Then the amazing little figure could be seen, darting in and out of the darkness, now bending behind some curious contraption on a frame, which then fizzled and sparkled, and turned into a whirring Catherine Wheel; now appearing in a completely different part of the scene from which would soon rise the long swoop and the soft explosion of a rocket in the air, its stars falling quietly above a crowd of upturned faces; and then Sinca would be found crouching behind a bouquet of Roman Candles, sending their heart-shaped flowers soaring to the sky. Crackers were child’s-play to Sinca, and he loved to set them hopping and sputtering among a crowd of people; for he himself was not unlike a cracker, mischievous and erratic. Sinca’s history was mysterious and romantic. A day or two before the bombardment of Sebastopol, two little Russian boys, aged about four or five [PB: probably 9 or 10], strayed out of the town into the English lines. The soldiers made friends with them, and the General decreed that they should be detained in camp till after the bombardment, as they would be safer behind, than in front of, the British guns. The children were brought into the town with the army, and criers were sent out, asking for their parents. No one claimed them. Their relations were either dead, or had left the town. What was to be done with the little Russian waifs? Two English officers adopted them, brought them home, and had them educated and taught trades. The children could never tell their surnames, and the soldiers named them Alma and Inkerman. Simeon Sinca was the little boy’s way of pronouncing his name of Simeon Inkerman. and so he was called to the end of his life. Thus the Russian sailor came to port at Wilton, where he married the nurse of my elder brothers, and between them they produced a family extremely unlike the Wiltshire children among whom they played. Edith Olivier (1872-1948), Without Knowing Mr Walkley (1938; Pan Macmillan 2014), no page number. So who was this “Lord Pembroke” who brought Simeon Sinca to Wilton? I suspect it was originally Florence Nightingale’s friend and supporter Sidney Herbert, Secretary at War during the Crimean War. Although he was never himself styled Lord Pembroke (he had an elder brother who lived and died in exile in Paris), Sydney Herbert ran the Pembroke family estate at Wilton for most of his adult life. When he died in 1861 his son George Herbert (1850 – 1895), took over as the 13th Earl. Simeon and George were similar in age. Perhaps Sydney Herbert had been funding and supporting Simeon in England since the Crimea, when George Herbert took over? Irene on Simeon’s knee, 1890. 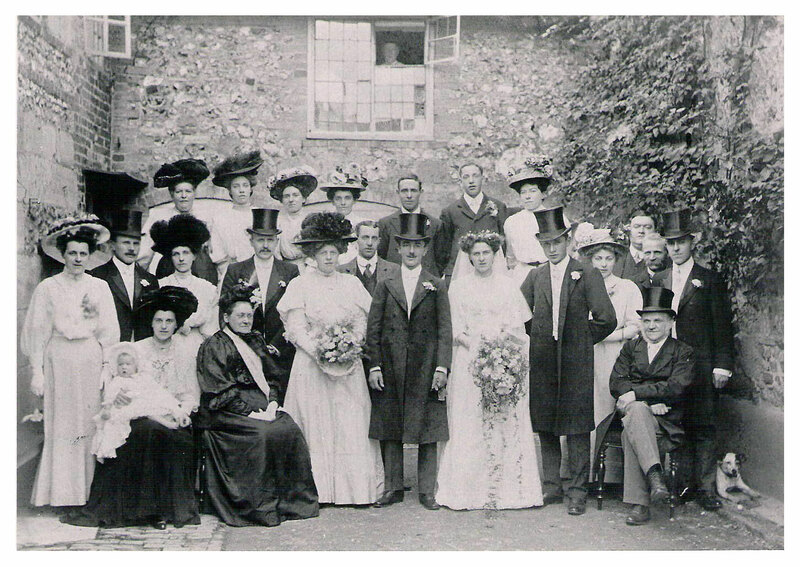 “Daisy’s Wedding”: Simeon (seated right) and family celebrate the marriage of his youngest child, Vera Daisy Sinca, and Sidney Charles Kingsford, 23 July 1908. Simeon Sinca, once a “tiny prisoner of the British”, died in Wilton on the 28th of April 1917. 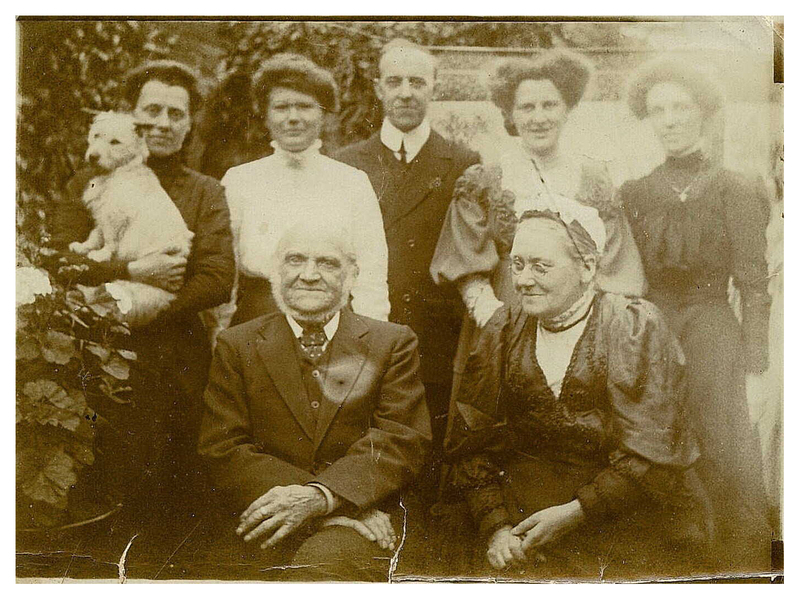 He clearly led a long and rich life, and family trees on genealogy websites suggest that he has numerous descendants in Britain, Australia and elsewhere. It has been a very satisfying history to explore and express. But I still have no idea what happened to his little friend “Alma”. I would also like to thank Wendy Leahy for her help in the research for this article. Any errors, of course, are entirely down to me. I would welcome further information. 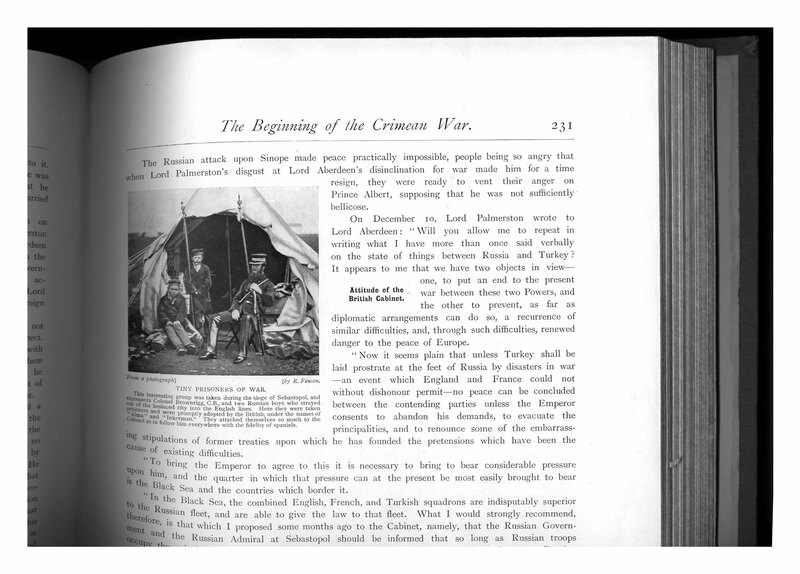 This entry was posted in Crimean images, Roger Fenton, Uncategorized and tagged Alma and Inkermann, Colonel Brownrigg, Crimean War, Identity of two Russian bys, Queen's Gallery exhibition, Roger Fenton by Philip Boys. Bookmark the permalink. Pingback: Down Rabbit Holes and Up Family TreesWhatever happened to ‘Alma’ and ‘Inkermann’? Very interesting story. 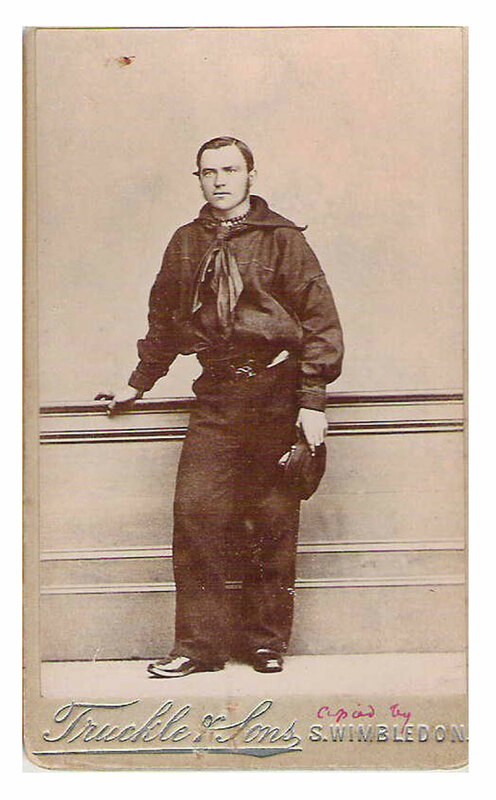 I have provided a link to it from our site https://downrabbitholes.com.au/2018/12/29/whatever-happened-to-alma-and-inkermann/ because of its link to the Crimean War and the Marshall family.